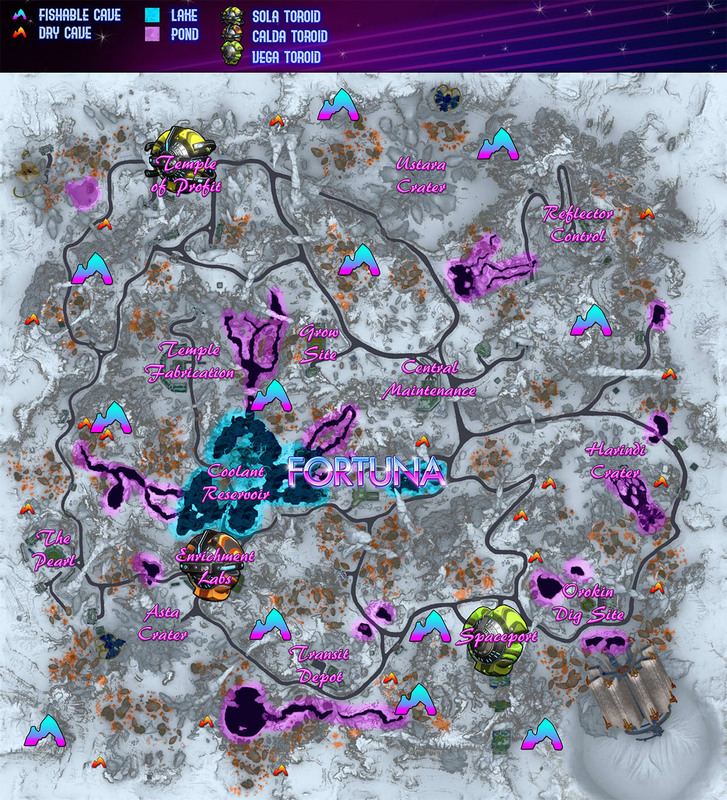 For a more in-depth introduction to fishing on Venus, try the Fortuna Fishing Guide on framemastery.com. Developed to perform remote construction and maintenance routines. It can be found in ponds around Venus. Used to record visual data in the aqua systems and transmits the telemetrics to the Research Station. It can be found in the lake on Venus. Collects fluid samples in the aqua system for the Research Station. It can be found in lakes around Venus. Analyzes the growth of microbes dwelling in the aqua systems to monitor toxicity levels. It can be found in cave pools on Venus. Repairs robotics that have broken down in the aqua systems. It can be found in ponds around Venus. A surveillance drone that monitors any activity that disturbs the waters. It can be found in ponds around Venus. Identifies organic threats to Corpus operations in the Aqua Systems and eliminates them. It can be found in the lake on Venus. Surveys the water for impurities. It can be found in cave pools on Venus. Facilitates long-distance communication between robotics deployed in the aqua systems. It can be found in the ponds around Venus. Its primary function is to reconstruct the bio-material used to regenerate Orokin structures. It can be found in cave pools on Venus. Repairs leaks and clear blockages within the aqua systems. It can be found in the lake on Venus. Programmed to break down chemical byproducts leaked into the aqua system. It can be found in ponds around Venus. Monitors environmental fluctuations. It can be found in the cave pools on Venus. Certain fish can only spawn when throwing bait near active "hotspots"; these are visible splashes on the surface of the water. No more than 4 fish will spawn at a given location at once. 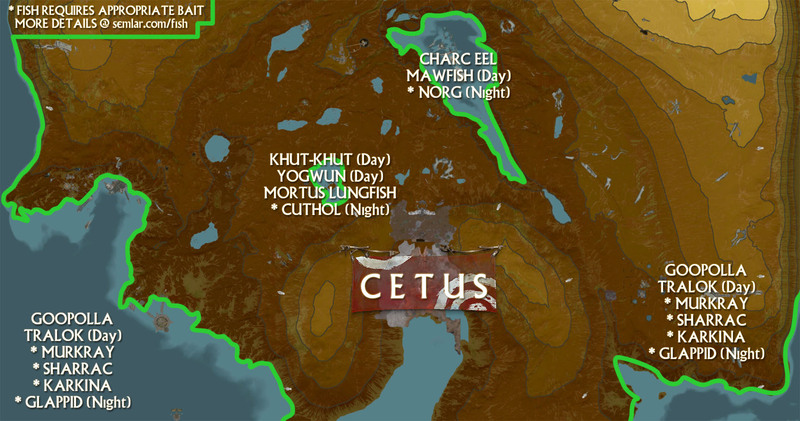 If a fish spawns while you have your spear out before you throw your bait, it will take up one of the 4 potential spawns you would have gotten from the bait. If you catch a fish before all 4 fish spawn it can prevent more fish from spawning. Bait can spawn common fish from the area rather than the intended type. If a hotspot disappears before 4 fish spawn, it may not spawn the rest. Discharges electricity from luminous glands along its flanks to stun its prey. A predatory fish that is attracted to the scent of blood. A poisonous fish protected by a hardened carapace around its skull. Its gaping maw allows it to scoop up smaller fish as it swims by them. This slow fish meanders through the waters and is often preyed upon by larger predators. A crustacean that hunts during the twilight hours. Displays blood-spattered pattern on its scales and has its ribs exposed through open cavities along both flanks. When predators approach it lies still at the bottom of the sand banks, disguised as a carcass in hopes of being ignored. While rarely venturing from the deepest waters of the plains, the Sharrac is a fearsome predator who will prey on unwary Ostrons swimming alone. Strong, predatory fish with eyes that can pierce the darkest shadows. A cunning hunter that hides within the mud at the bottom of the lake and ambushes passing prey. This fish inhabits the shallows and feeds of crabs and other small crustaceans. When threatened it forces air into its brain to give it the impression of being much bigger than it normally is. A grotesque crustacean that produces a potent, paralyzing toxin from its tentacles. The Glappid is a scavenger that feasts on the remains of dead fish. It has formed a symbiotic bond with the Seram Beetle which extracts and feeds upon any toxins ingested by the Glappid.